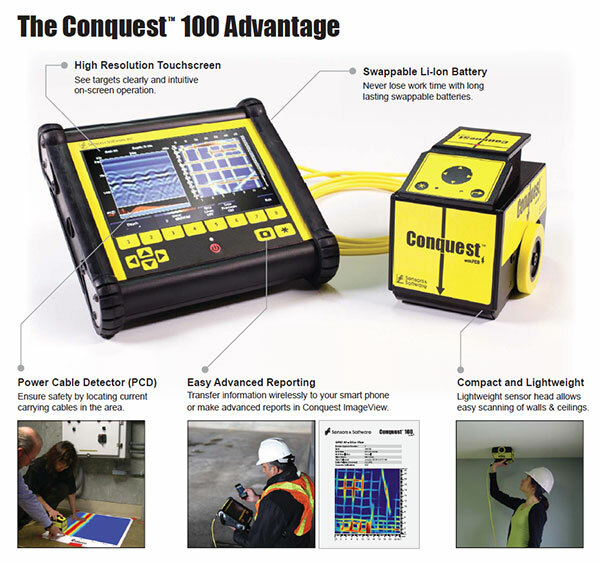 The Conquest 100 Ground Penetrating Radar (GPR) is designed for safe, non-destructive evaluation of concrete structures. 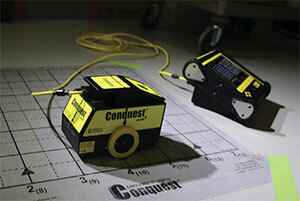 Conquest offers rapid on-site imaging for cutting, coring, drilling, or the characterization of concrete slabs with limited or missing design drawings. The Conquest 100 uses radio waves to locate objects of differing dielectric constant. Therefore materials such as plastics, metals, and filling material can be located inside the concrete. A line scan is a pseudo image which slices through the concrete. A cylindrical target like rebar appears as a hyperbolic shape on the Line Scan. The image above shows three rebar at varying heights as well and the bottom of the concrete which is also reflects the radar signal. Supplied with the Conquest 100 Enhanced, Ekko_Project is powerful report creation and data storage software that uses a single file to store all information connected to a GPR project. 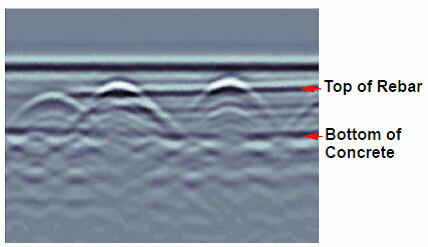 All GPR data, photos, notes etc. are housed in a single Project (.gpz) file that can be added to throughout your project lifetime. A custom report can then be output from this data. It can also be used to stitch together multiple grid scans into one large visualisation of the structures embedments.